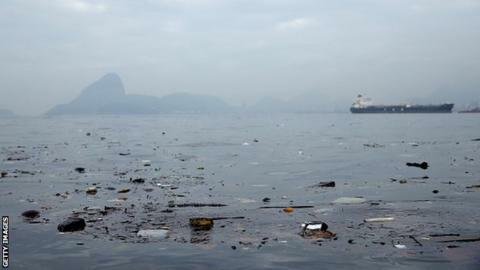 World Rowing has called for tests for viruses to be carried out in waters to be used at the Rio Olympics in 2016. It follows the International Sailing Federation's confirmation it will carry out research on the water quality. An Associated Press investigation found that the sailing venue at Guanabara Bay is badly polluted, as is Rodrigo de Freitas lake, which will host rowing and canoeing. It is claimed the levels of raw sewage pose a serious health risk to athletes. Olympic test events in sailing, triathlon and rowing have been taking place this week. Peter Sowrey, chief executive of the International Sailing Federation (ISAF), said the Associated Press' findings have helped "wake us up again". "I want to make sure everyone who goes out in the water is safe," Sowrey added. "We're going to find someone who can do the testing for us that can safely cover what we need to know from a virus perspective, as well as the bacteria perspective." The investigation also showed venues for triathlon and open-water swimming off Copacabana Beach had high virus levels that pose a threat to athletes and tourists. Up to 1,400 athletes will compete in water sports at the Games and, in a statement to AP, the World Health Organisation said it has suggested the International Olympic Committee start monitoring for viruses at the Rio venues. What is Rio's Plan B? When Rio was awarded the Olympics in 2009, it promised that cleaning its waters would be an Olympic legacy, but Rio Mayor Eduardo Paes has repeatedly acknowledged this will not be done, calling it a "lost opportunity". Sowrey said a "backup plan" included sailing all the events outside Guanabara Bay in the open Atlantic. The ISAF has three courses there, and three inside the bay, but Sowrey said it would be "heartbreaking" to sail outside the bay and lose the picture postcard backdrop of Sugarloaf Mountain that will be a focus of television coverage.